Extra large size 2 inch hoops earrings, these comfortable hoops are as easy to wear with jeans as a little black dress. 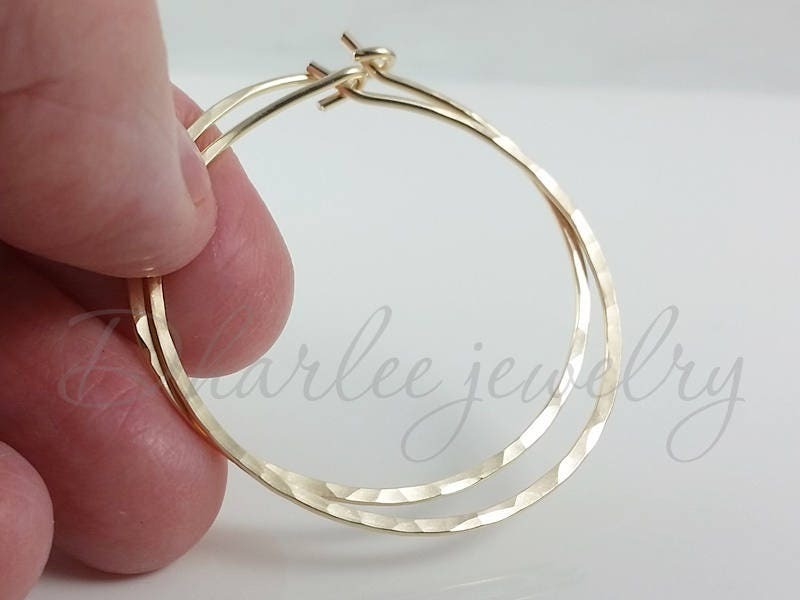 They are wonderful everyday earrings, sure to be a go-to pair in your jewelry wardrobe. They are made from 18 gauge 14K rose or yellow gold filled wire that has been hammered for style and strength, then tumbled for shine. I hammer them for an organic faceted effect on one side and the other side is smooth. Switch sides for a different look! They will measure either 1.5 inch (approximately 38mm) or 2 inches (approximately 50.8mm) depending on which size you choose. Each pair is made as the orders are placed, brand new, just for you. The other side of these earrings have been left smooth so all you need to do is switch ears to have a different look. If you prefer on single earring, please message me and I will certainly make one for you. Great earrings, i love them!